Each of our Fiesta tableware kits service eight guests and include various decoration items to add to your fiesta table and party decorations. This colorful Fiesta tableware will spice up your buffet or individual table settings for your guests to enjoy during this annual holiday or summertime party. 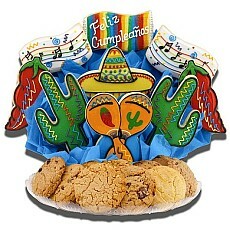 Celebrate your next birthday fiesta with this bright and festive cookie boutray.- This item is priced as a 9 cookie.